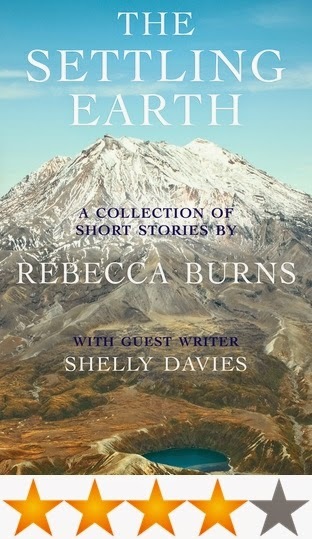 The Settling Earth is a collection of 10 intertwining short stories, set in the1800s in colonial New Zealand, focusing on the British settlers and their lives in a new country. Sarah has been uprooted from England and is living on a sheep run on the Canterbury plains; her husband William, too often visits the brothel in Christchurch; Phoebe is trying to stay away from abusive Oliver, worried that he will find her or their child; Mrs. Gray takes women's unwanted babies in for them; Laura paints in secret; and Haimona doesn't understand the way of the white man. Each story is only a few pages long, but each of them are connected in some way, which makes for a very interesting, and creative read. I haven't read too many books like this, so it was really great to have the opportunity to do so. I really liked the way they did all intertwine as they did, including the last short story, by guest writer Shelly Davies, which concluded the book in such a great way. While the individual stories are very short, it was written in such a way that you really connected (or didn't, as it were in some cases) with the character, and felt for them. I think being able to do that in such a short space of pages is a real gift. I don't read a lot of short stories (I think I had to read too many in high school! ), but this was a really refreshing read, and even though I read it one sitting, it would be a brilliant book to pick up and put down several times and not loose the story at all. I think another thing that I really enjoyed about it was simply reading about my country back in the day. We all do New Zealand history at school, but it was really nice to read about the people from those times rather than gigantic historical prose about who-knows-what. Burns obviously researched a lot (or knew her history well), and I could picture every place perfectly in my mind, as there were places where the characters walked where I have walked, or go past even now in 2015. If you're after a set of great short stories, then do read this book. It will make you think, it will make you smile, and the last sentence will make you grin like a maniac. Thank you, so much, to you, Rebecca Burns, for providing me with a copy of your brilliant book for an honest review. This sounds awesome, I love it when books have lots of connected characters - will definitely check this out today! A Journal Giveaway & Your Chance To Join Team BB!